Samrina Marshall is a physician with core interests in improving healthcare delivery and quality health outcomes particularly in vulnerable and underserved communities. Most recently, she was the Medical Executive for Medicaid at Evolent Health leading the value-based care growth, implementation and operations of Medicaid health system partners across the country. In that role, she was the clinical lead for a high-risk patient care model, physician engagement and practice transformation in various settings from community clinics to academic medical centers. 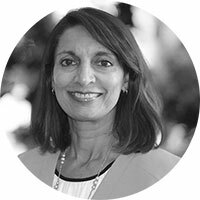 Previously, she has served as the Chief Medical Director for Centene in California overseeing the medical services for over 200,000 Medi-Cal members where she was responsible for the quality of patient care and provider performance standards. Critical to that role was building relationships with key community partners and development of services such as telehealth to support the access needs of a largely rural population. Dr. Marshall is a board-certified pediatrician with over 25 years clinical experience including several years at UC Davis Medical Center where she keeps her volunteer clinical faculty status. She attended medical school at the University of Southern California and residency at Children’s Hospital of Los Angeles. She currently serves on the board of the Yolo Crisis Nursery, a non-profit organization that supports families in crisis to prevent child abuse.